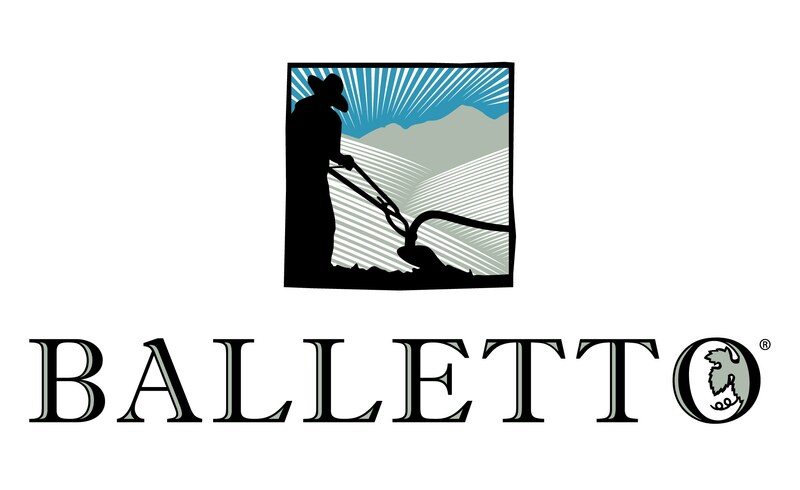 Balletto Vineyards & Winery produce wines that offer true consumer value. This week I sat down with Anthony Beckman, the man responsible for making the delicious wines at the Balletto Winery. The Russian River Valley in Sonoma, California where the Balletto Vineyards & Winery are located is influenced by maritime induced fog late into the morning, turning to sunny clear blue skies late into the day. The cool prevailing winds that influence this area are perfect for growing exceptional grapes. The fog blankets the grapes with moist dew throughout the night into the late morning hours, allowing the grapes of the Russian River Valley to mature slowly which produces fruit of concentrated flavor and superior quality. 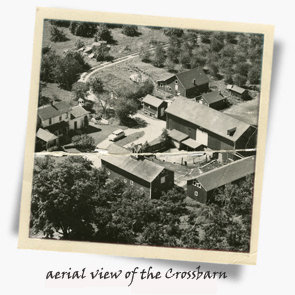 The RRV is one of the premier grape growing areas in the New World. 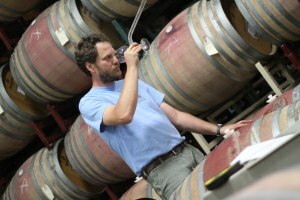 Beckman is one of my favorite winemakers for what he does not do to the grapes. The Balletto wines are handled gently from the vine, to the press, not overly manipulated during fermentation, and then aged with special care. 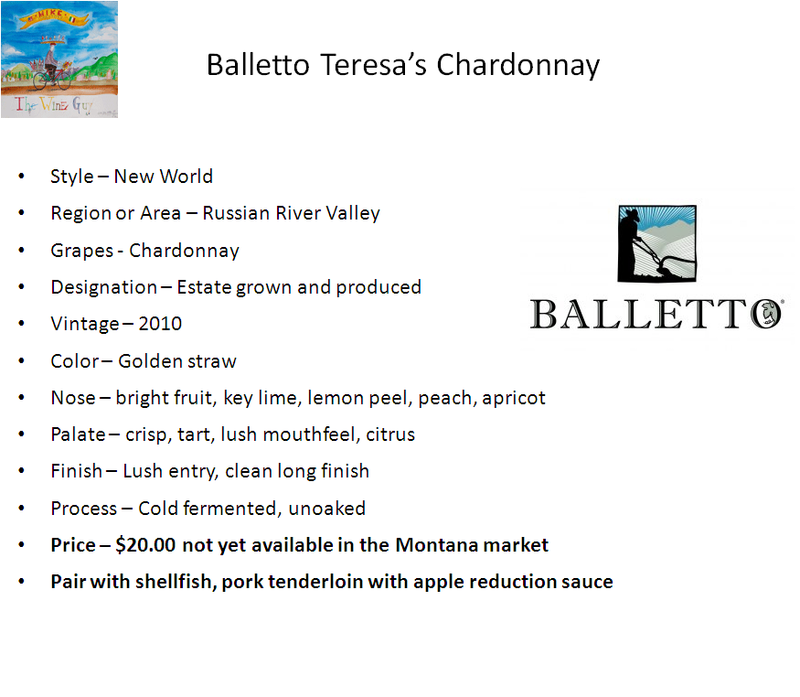 The Balletto wines are some of my favorite to drink, they are true to the varietal character and affordable for the everyday wine drinker. 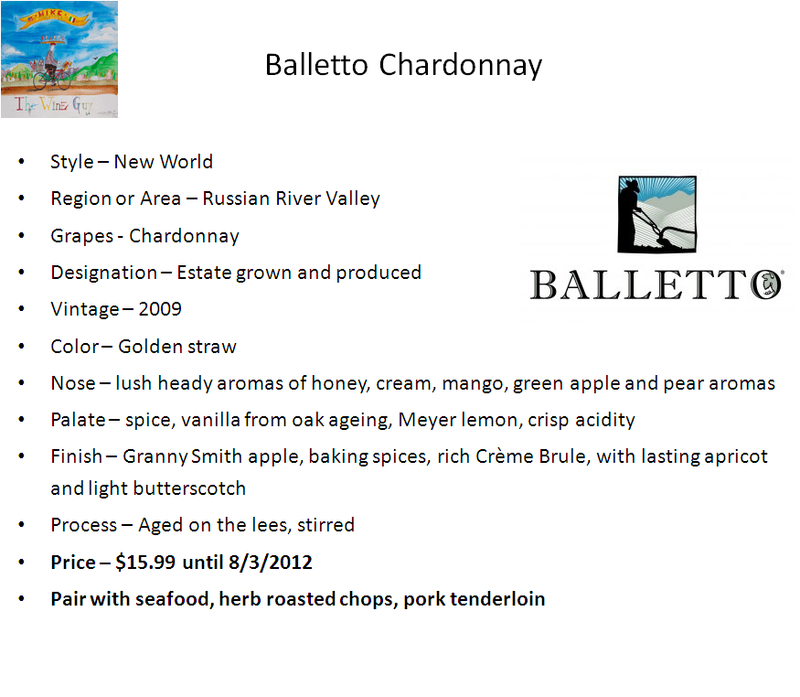 Every one of the Balletto wines are exceptional, a true consumer value. 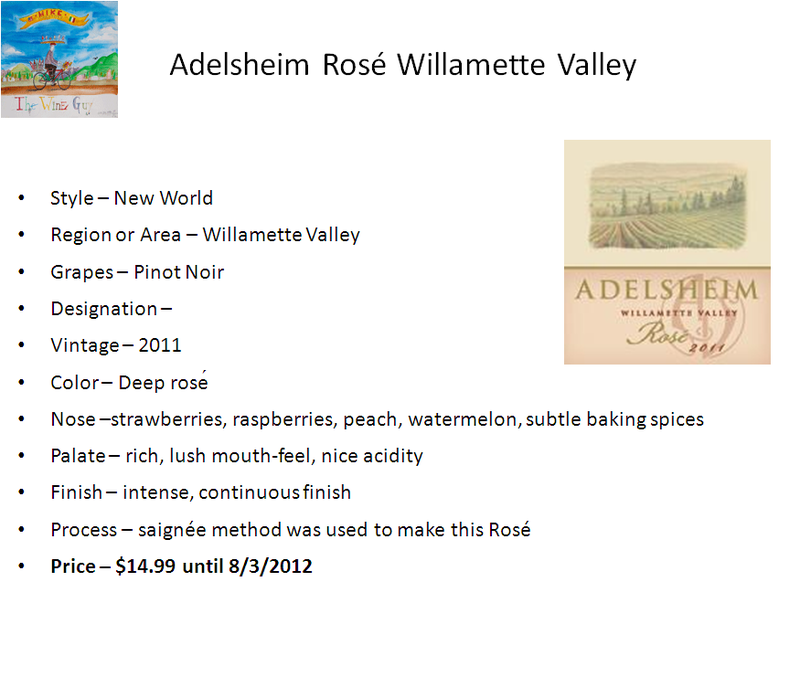 Beckman’s 2011 Roseof Pinot Noir is straight up the finest RoseI have ever tasted from the New or Old World. This roseis everything I want a rose to be. A great roseshould have beautiful color, fresh aroma of strawberries and raspberries, refreshing like a white wine with subtle mouthfeel like that of a red wine. 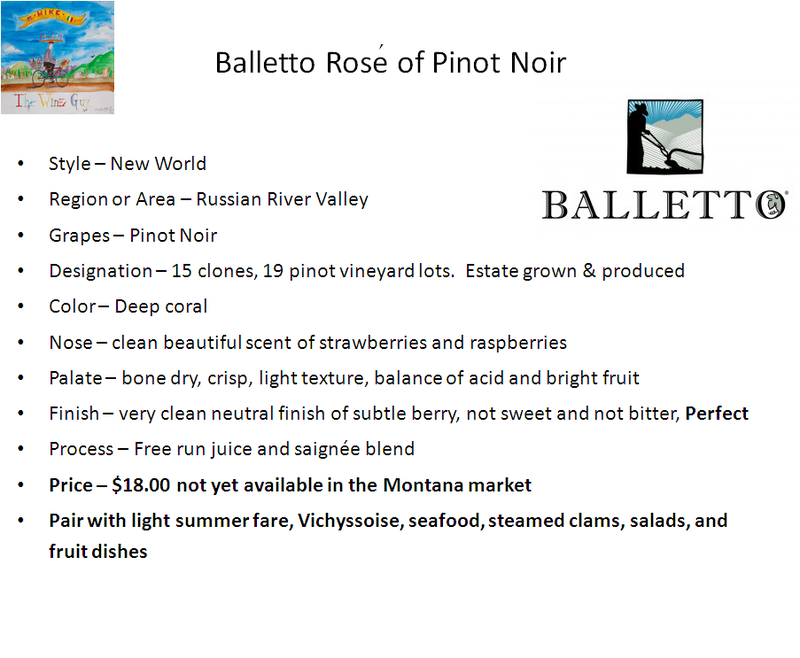 The Balletto 2011 Roseof Pinot Noir is all of that and then some. 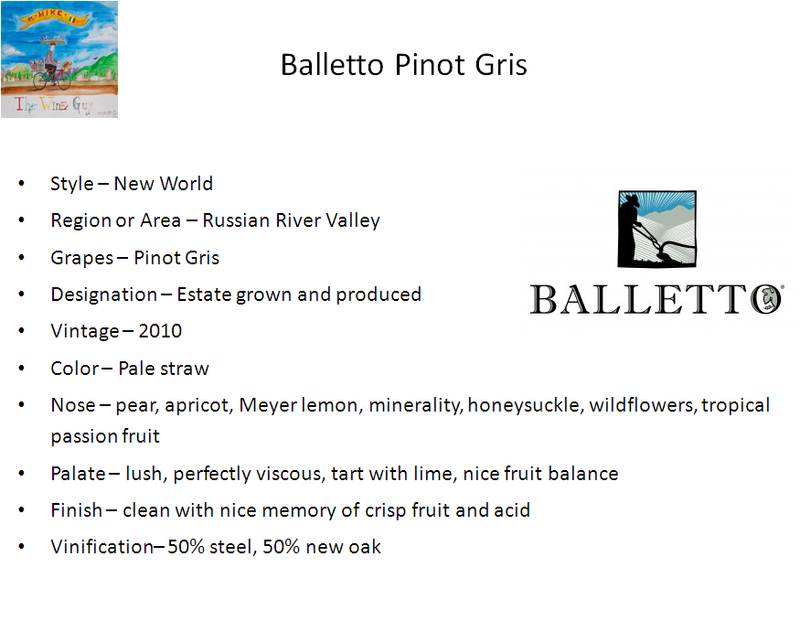 I would like to thank my friend Anthony Beckman for taking time to be on the WineGuyMike Radio Show this week and all my friends at Balletto Vineyards & Winery, one of the best consumer values in wine. Today’s wines all receive the WineGuyMike™ Seal of Approval™ and are available at Liquid Planet in the Heart of Downtown Missoula. 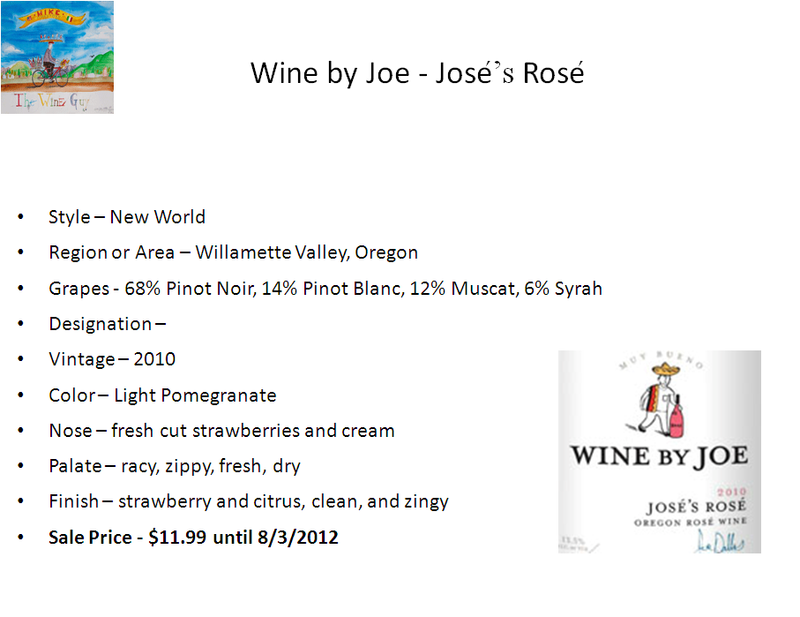 All of these excellent wine selections (see below) have been especially priced for you. 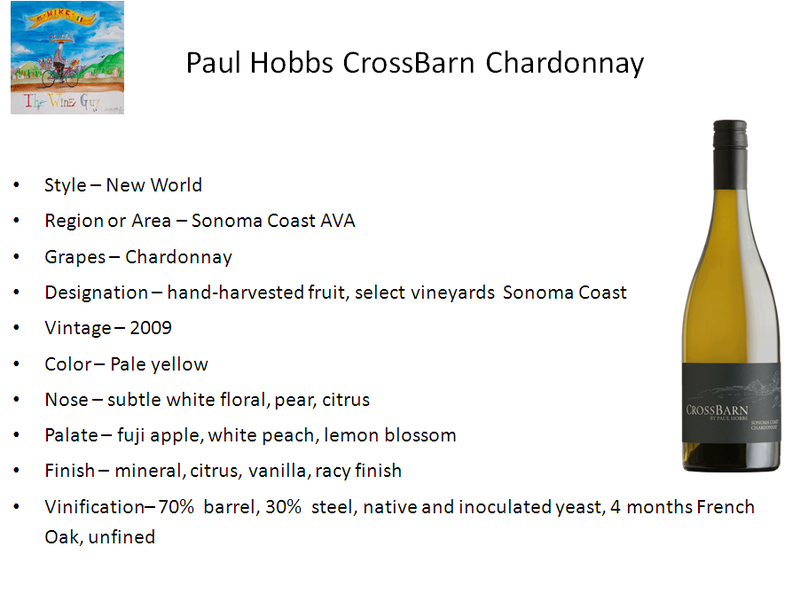 This wine pairs well with shellfish and will be on sale for $24.99 until Friday 8/03. 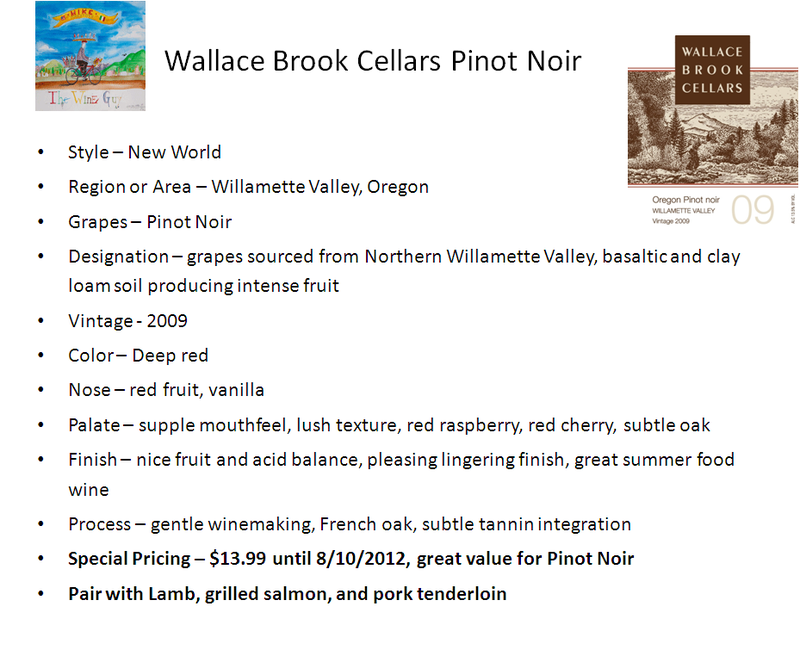 This wine pairs well with Lamb and Chops, it will be on sale for $28.99 until Friday 8/03. 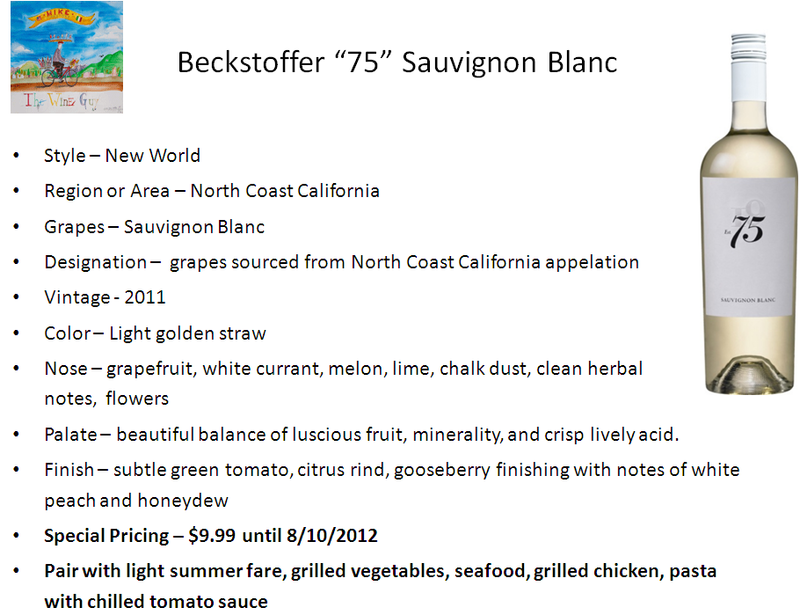 This wine pairs well with grilled meats having ample marbling and will be on sale for $33.99 until Friday 8/03. 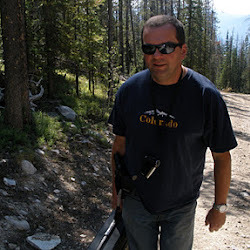 Remember to stop in at Liquid Planet, Missoula’s best wine shopping experience, to purchase your WineGuyMike wines. 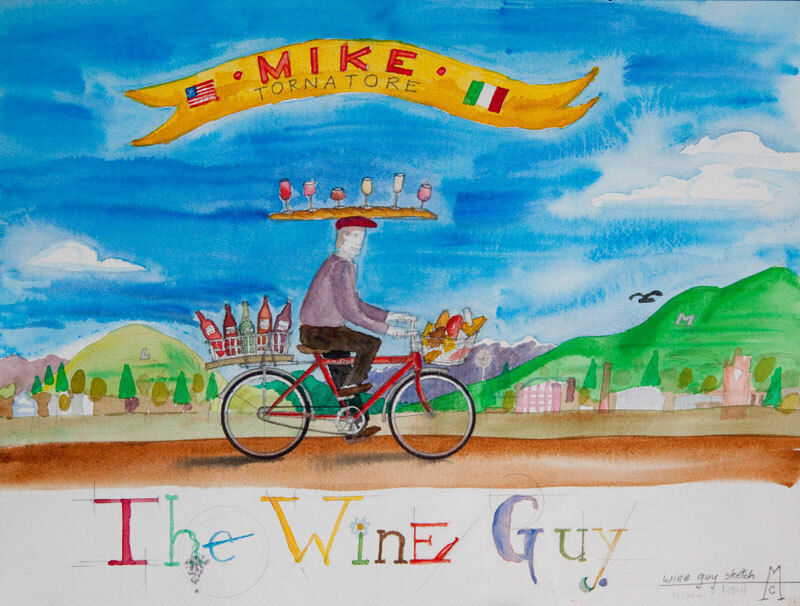 Welcome to the WineGuyMike™ Radio Show© this Sunday morning. Fall is in the air, colors of trees are changing and beautiful. Soccer and football fields are filled with kids, coaches, and parents. The air is becoming brisk, the sun is lower in the sky yet still warm enough in the afternoon that you have to shed your jacket. 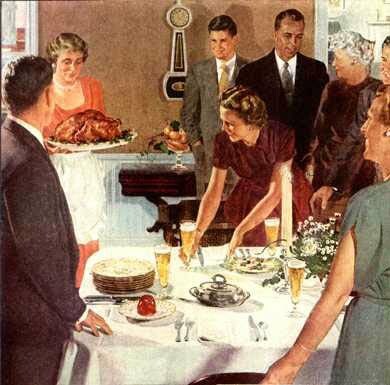 It occurs to me that with each new season the types of food we eat, the way we prepare food, our style of food, how we drink wine, and the type and style of wine that we drink bring about a palate of change. Cooking has moved indoors, cooking on the stove top and using our ovens again rather than cooking everything imaginable on the grill. Warm summer days, congregating on the deck with family and friends, grilling, enjoying a cold beer or a nice glass of chilled wine are quickly winding down. We begin thinking about food dishes that are transitional, it’s not time for winter comfort foods just yet, but it is time for a great pot of chili or soup. Just as our desire for food changes so does our palate for wines. 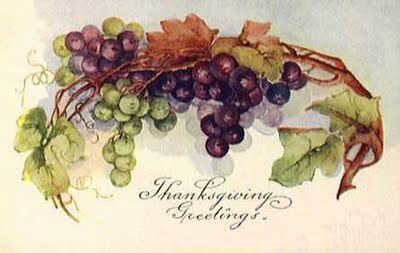 Since the beginning of time Old World Winemakers have made wines that are seasonal and specific. In the Old World wines are made specifically to complement indigenous foods. Old World winemakers will also make wines that are seasonally appropriate, even if they may not be known for their summer wines. Even in Tuscany when its 90 degrees outside you need something chilled to drink. As our desire for different styles of food is changing with the season so are our wine palates. It is interesting how wine choices mirror the foods we are seasonally preparing. There is a shift from lighter fare to dishes that have a bit more substance. Wines that we now consider will also change as a result. While it may not be time for comfort food yet it is time for comfortable soups, chili, and light stews. So now it’s time for wines that have more body and texture. Life is about a journey and evolution and so goes the world of wine. How boring would it be if nothing ever changed? Grape farming has become very specific, not that it hasn’t been in the past. Science and terrior have become a powerful driving force. Grape farmers around the world now look to science and have a much deeper understanding of terroir. This conformation of the farmers’ sixth sense and intuition produces beautiful grapes for the winemaker. Grape farmers from around the world are not just growing fruit in general area that they know fruit grows well, it is much more specific than that. Farmers know and understand their land and winemakers that turn the grapes into wine will be the very first to tell you the land and terrior that produce great wine. 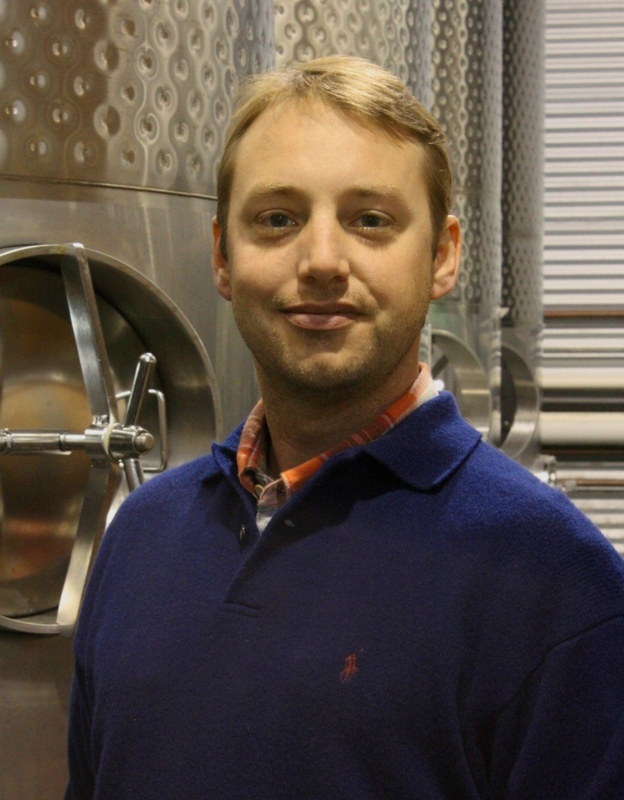 Great winemakers comment that it’s ninety percent of the equation. Grapes are now being planted and harvested from specific blocks of land within vineyards for winemakers to make special wines with. Typically these are higher end wines that can be expensive. It is important to understand where a bottle of wine comes from and why. 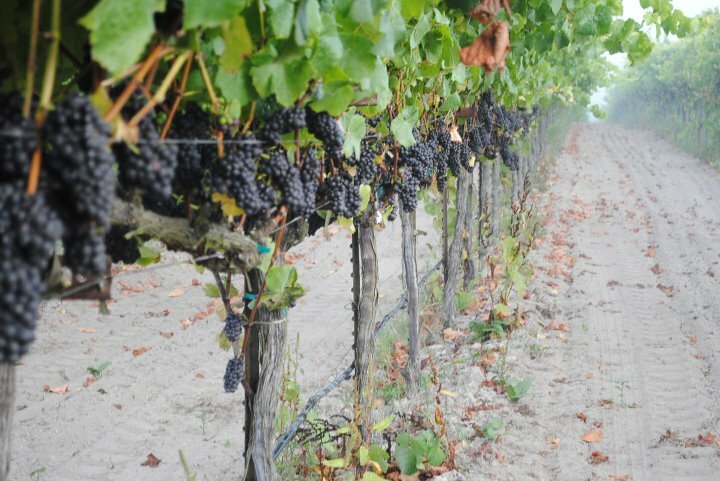 Farmers consider geography, soil, weather, and the grape varietal when planting vines. The farming trend now considers this in a grape type; is the varietal a valley grape, a hillside grape, or a hilltop grape? This all makes a difference in the vinification or winemaking process of great wines. Farmers and winemakers consider what grapes grow best where? Are they a cool weather varietal that grows best in a zone 1 weather region that is the coolest growing area. Or does a particular varietal grow best in a warm to hot zone like a region 4 or 5. There certainly are cross over areas where grapes can thrive, but the grape farming trend now much more exact. Grapes that are a cool weather varietal or type provide the very best fruit when grown in zone specific areas. Different grape varietals require what is known in the world of wine as hang time. This means how long a grape needs to be on a vine from flowering, to actual fruit on the vine, maturation, and veraison or onset of ripening right up until the perfect moment of harvest. What does this mean for the wine drinker? 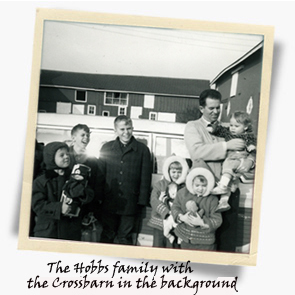 Why is that important in this season of change and transition? Grapes grown in various climatic zones produce wines that are very different. 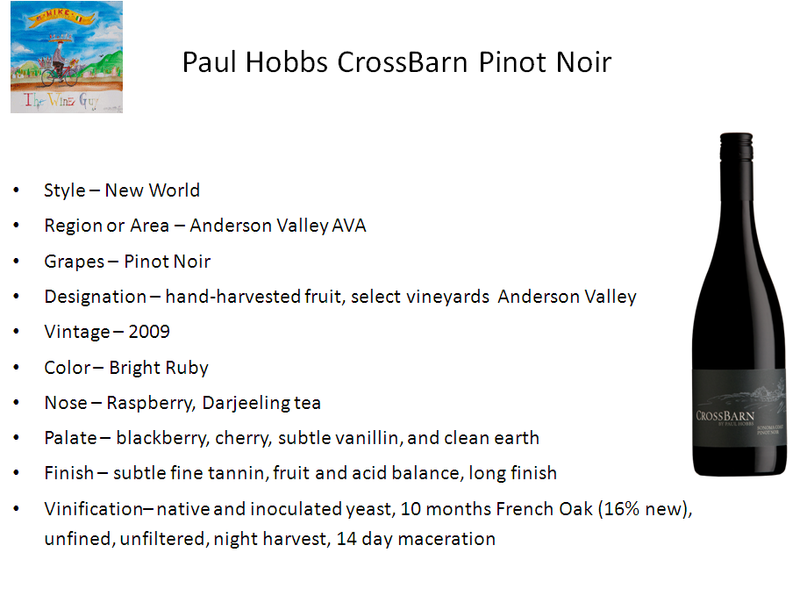 Let’s take Pinot Noir as an example; a Pinot Noir that is grown in a cool weather climate like Oregon, or Burgundy will have medium body, no heavy tannin, it will show a little less depth in color, this is a wine of elegance and finesse. 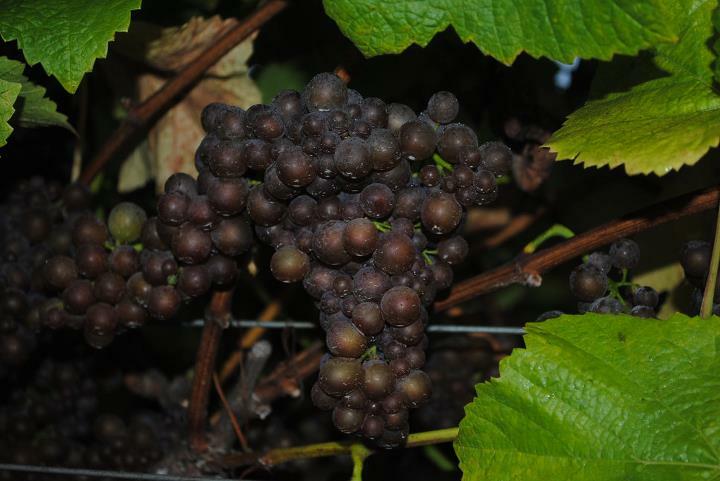 A Pinot Noir made from grapes in a warmer weather zone will produce a wine that is higher in alcohol, more tannin, and more color extraction from the grape. 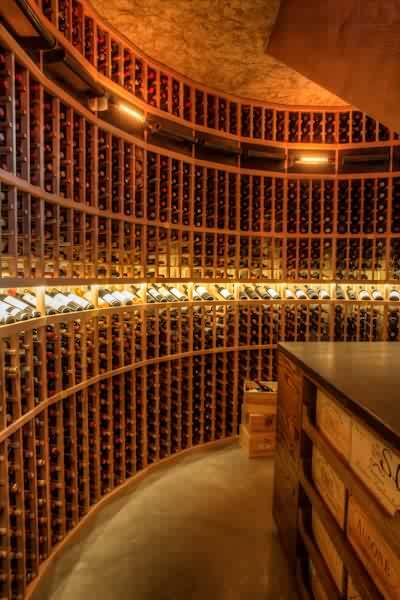 Wine knowledge empowers you as a consumer. It is important to know what a wine should be so that when you approach a shelf you can make the right choice that it is of value for you. Here are a few examples of great wines to complement your dishes in the season of change. 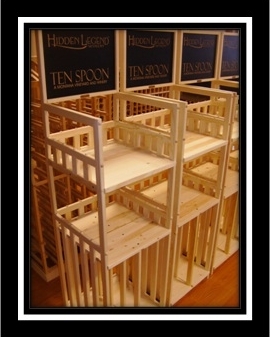 I hope you will enjoy these selections. This is a beautiful wine that is inexpensive. 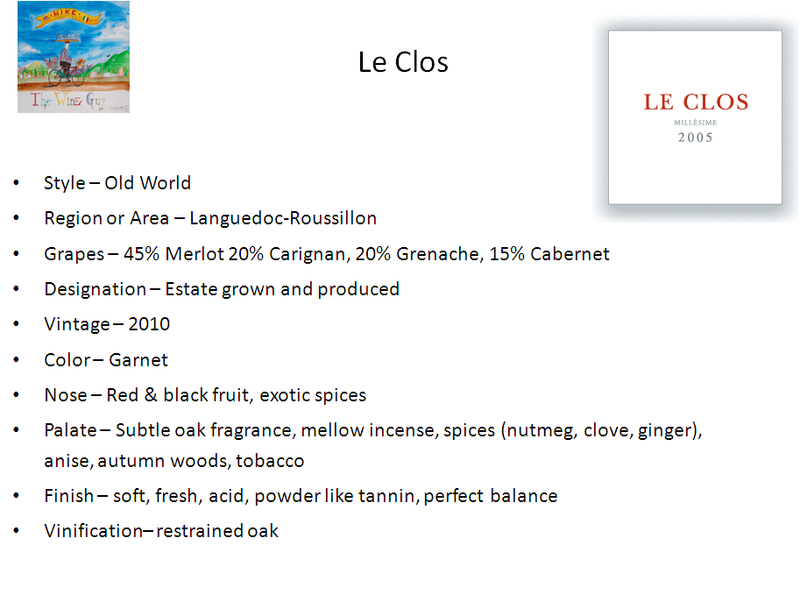 This blend from the well known Guigal family is 50% Syrah, 40% Grenache, and 10% Mourvèdre. The grapes are grown in pebbles and alluvia soil matter, sediment, limestone, granite. This provides great drainage for the grape vines. The grapes for this wine spend a great deal of time with the skins are fermented in a cool temperature controlled environment. Aged 1 ½ years in oak but this wine presents with only a minimal oak influence. Visually this wine is dark red with great depth, and a beautiful shimmer. 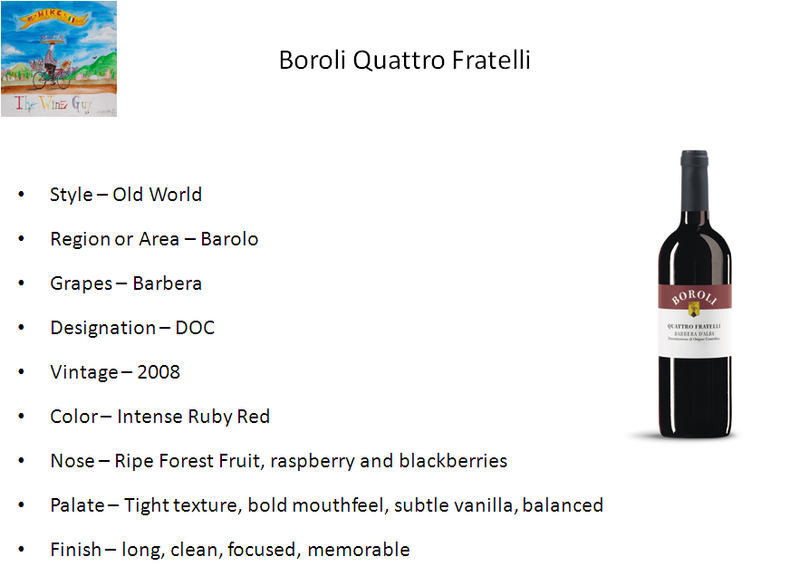 On the nose this wine has an aroma of red berries, fresh fruit, and just a hint of spice. The palate is ample, not to full, really a great example of an affordable Cotes du Rhone. This wine is balanced and very well made. 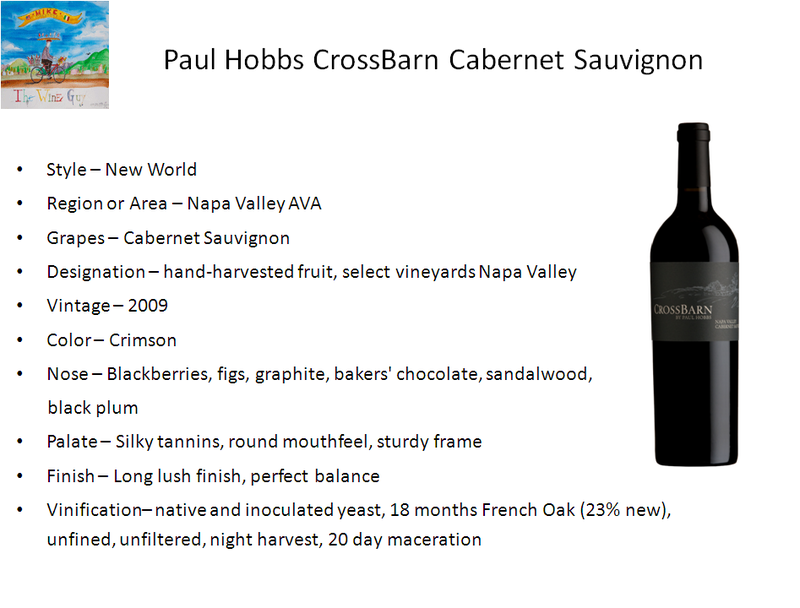 Nice tannin and spice that is enticing with a long rich finish. This wine is very aromatic in a very pleasing way. 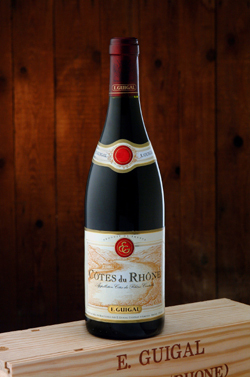 The Guigal Cotes du Rhone Red will pair nicely with cold cuts, cheese, wild game birds, pheasant and quail in particular. This dark, garnet colored Pinot Noir exhibits floral aromas of rose petals, spicy ginger, dusty earth, and a hint of vanilla. This stellar example of a cool weather varietal fruit from the Russian River Valley delivers aromas of raspberry and cassis which are the heart of this wine. On the palate this wine is medium textured with fine tannin, beautiful balance between fruit and acidity with an alluring spice that may be more interesting than any other wine. This finish is long and complex; you just need another sip because you don’t want this wine to end. This wine may age up to five years and will only improve with age, but who can wait this wine is delicious. 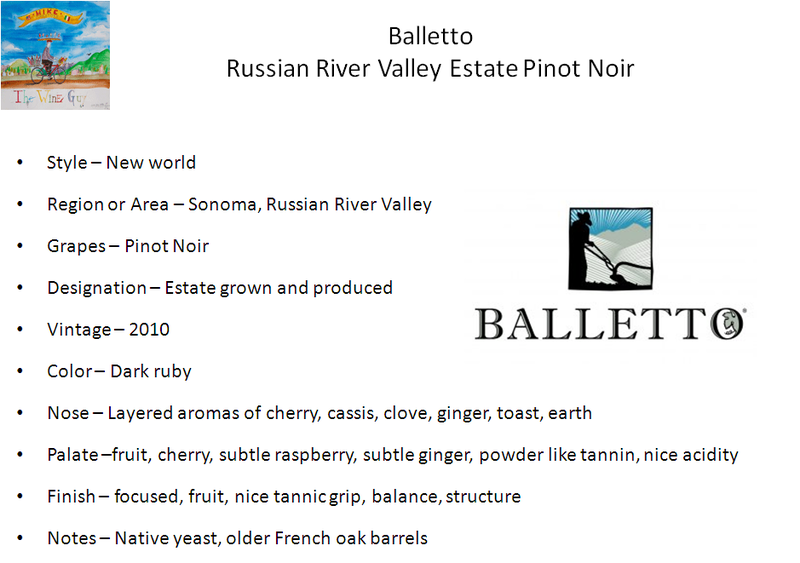 The Balletto 2009 Russian River Pinot Noir will pair well with beef stock based soups, a great pot of chili, beef stews, beef bourguignon, beef stroganoff, or a nice Cornish game hen with wild rice. This 100% Syrah is aged in old French Oak barrels that impart very minimal oak nuances into this delicious wine. 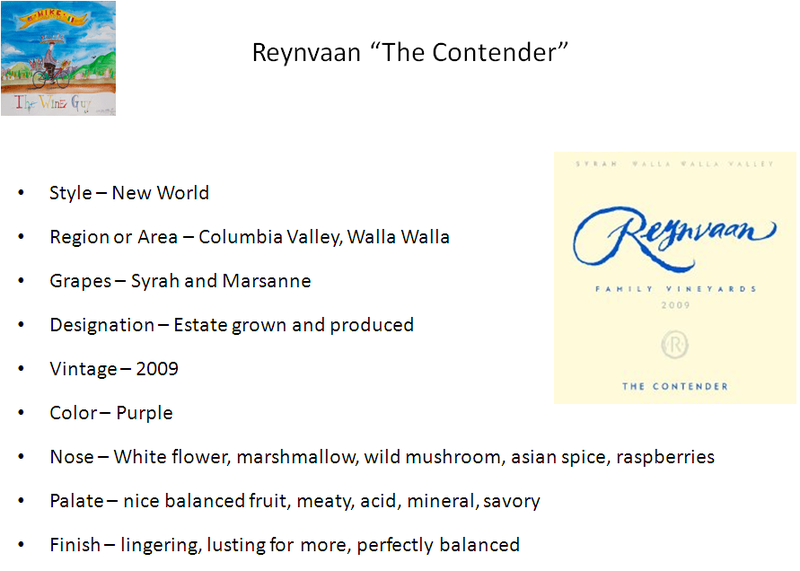 Ripe blueberries, lavender, and subtle orange zest is your first impression of aroma with this gem from Walla Walla. Take a second turn with your nose in the glass, smoke and earth now adorn your sense of smell. 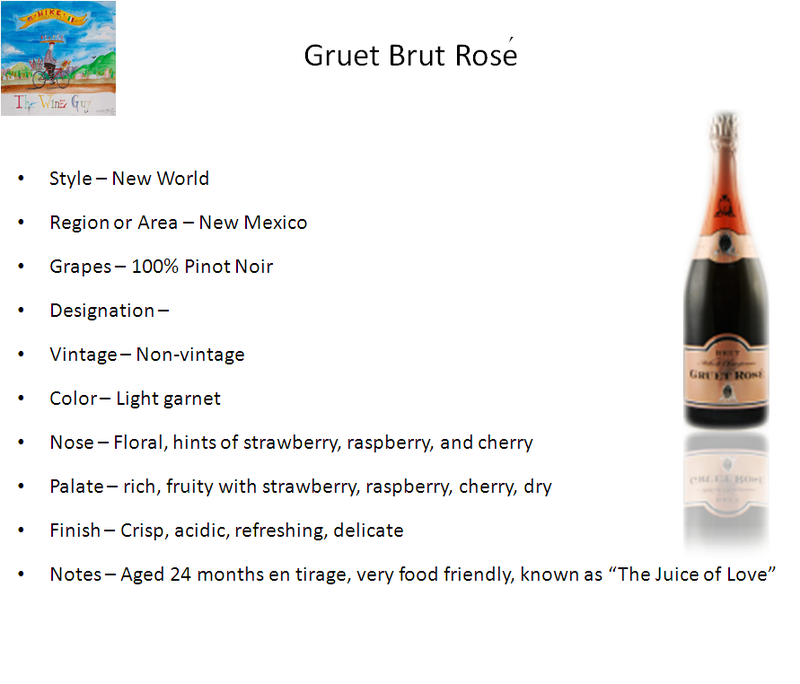 Take a sip, on the palate this wine has nice berry and pomegranate with a subtle smokiness that is full and lush. Not so big that you can eat this wine though, it is very well made with a refined balance and structure. The acidity in this wine is well suited to pair with a juicy steak or a nice cut of wild game adorned with a fruit based reduction sauce. This wine drinks great now or can be aged 2-3 years.